Here in South Florida, our subtropical climate enables us to grow many tropical varieties of fruits, vegetables herbs and edible flowers quite successfully. The high humidity and warm climate present unique disease, weed and pest control challenges to organic growers. In keeping with our commitment to future generations, we adhere to strict organic practices and use sustainable agriculture methods whenever possible. During the winter growing season, we grow an assortment of vegetables, herbs and edible flowers. These are available for sale through our Community-Supported Agriculture (CSA) farm membership program and Farmers Market. We also sell at our local Farmers Market. Come see us every Sunday 9am-2pm at the Pinecrest Gardens Farmers Market. The market is located on Red Road (SW 57th Ave) & Killian Drive (112th St), under the banyan trees. In the summertime, we let the fields recharge for the winter, catch up on projects around the farm, and harvest our famous Donnie and Hardee avocados. These are available mail-order. We also offer limited webstore sales of seasonal local summer produce, mainly tropical fruit such as mangoes, lychee, carambola, jakfruit, mamey sapote, along with eggs, honey, herbs and tropical vegetables. 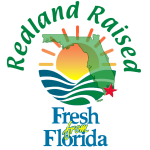 Some years back we formed Redland Organics, a loosely-organized group of local organic and sustainable growers working together towards a common goal – to stimulate our local economy and support local small family farms while providing the consumer with high-quality, locally-grown, organic and pesticide-free produce at a reasonable cost. We started a multi-farm Community-Supported Agriculture (CSA) farm membership program over a decade ago. We offer weekly shares of vegetables, herbs, edible flowers, honey and eggs from November through April for South Florida residents in the tri-county area of Miami-Dade, Broward and Monroe. All the produce in our shares is either certified organic or pesticide-free, and is grown by us or our farm partners. 100%* of it is locally-grown within the South Florida area, which we define as a line across the state from the top of Lake Okeechobee south. This is roughly about 150 miles from our farm as the crow flies. *Because of citrus canker and now citrus greening, we occasionally reach out to our Central Florida organic citrus producers to complete the shares.